, F. R. S. an eminent naturalist, is thought to have been born in London, about 1710, but of his early life and occupations no certain information has been obtained, except that he was engaged in mercantile pursuits. He imbibed a taste for natural history, probably when young, made collections of natural curiosities, and by attentive observation and depth of thought soon rose superior to the merit of a mere collector. It is to him we owe the discovery of the animal nature of corals and corallines, which is justly said to form an epocha in natural science. The first collection he made of these new-discovered animals, after being presented to, and examined by the royal society, was deposited in the British museum, where it till remains. His mind was originally turned to the subject by a collection of corallines sent him from Anglesey, which he arranged upon paper so as to form a kind of natural landscape. But although the opinion he formed of their being animals was confirmed by some members of the royal society, as soon as he had explained his reasons, he determined to make farther observations, and enlarge his knowledge of corallines on the spot. For this purpose he went, in August 1752, to the isle of Sheppy, accompanied by Mr. Brooking, a painter, and the observations which he made still further confirmed him in his opinions. In 1754, he prevailed on Ehret, the celebrated botanist and artist, to accompany him to Brighthelmstone, where they made drawings, and formed a collection of zoophites. 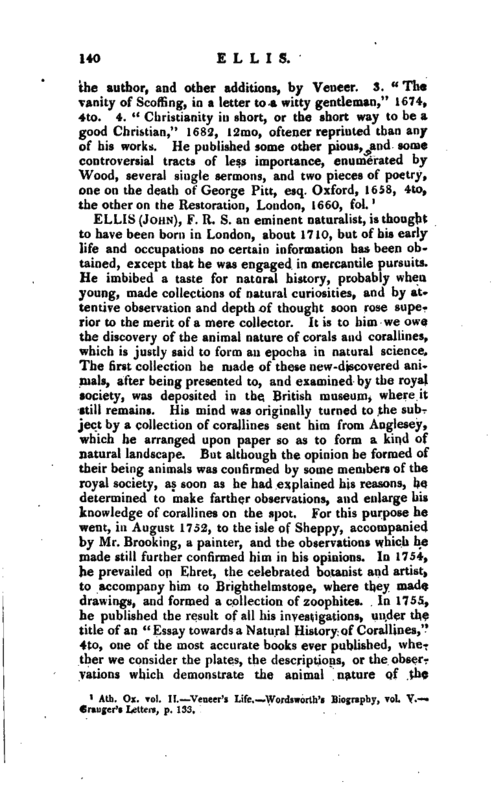 In 1755, he published the result of all his investigations, under the title of an “Essay to wards a Natural History of Corallines,” 4to, one of the most accurate books ever published, whether we consider the plates, the descriptions, or the observations which demonstrate the animal nature of the | zoophites. His opinions on this subject were opposed by Job Easier, a Dutch physician and naturalist, who published various dissertations in the Philosophical Transactions in order to prove that corallines were of a vegetable nature. But his arguments were victoriously refuted by Ellis, whose opinions on the subject were almost immediately assented to by naturalists in general, and have been further confirmed by every subsequent examination of the subject. In botany Ellis distinguished himself by an account of two new genera, the Halesia and Gardenia, both American shrubs, the former named after his learned friend the Rev. Dr. Hales, the latter named after Dr. Garden, long resident in Carolina. He published also a pamphlet on the Venus’s Fly-trap; and was the author of a fourth new genus, Gordonia, named after Mr. Gordon of Mile-end, which was described in the 60th vol. 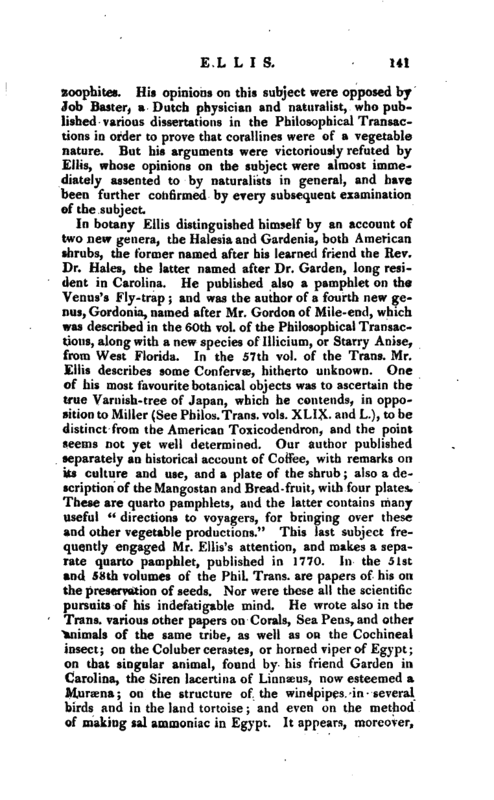 of the Philosophical Transactions, along with a new species of Illicium, or Starry Anise, from West Florida. In the 57th vol. of the Trans. 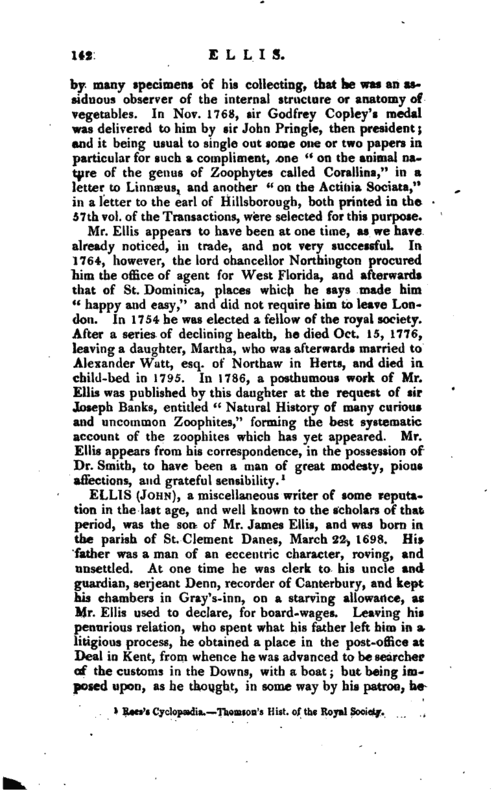 Mr. Ellis describes some Confervae, hitherto unknown. One of his most favourite botanical objects was to ascertain the true Varnish-tree of Japan, which he contends, in opposition to Miller (See Philos. Trans, vols. XLIX. and L.), to be distinct from the American Toxicodendron, and the point seems not yet well determined. Our author published separately an historical account of Coffee, with remarks oa its culture and use, and a plate of the shrub; also a description of theMangostan and Bread-fruit, with four plates. These are quarto pamphlets, and the latter contains many useful “directions to voyagers, for bringing over these and other vegetable productions.” This last subject frequently engaged Mr. Ellis’s attention, and makes a separate quarto pamphlet, published in 1770. In the 51st and 58th volumes of the Phil. Trans, are papers of his on the preservation of seeds. Nor were these all the scientific pursuits of his indefatigable mind. He wrote also in the Trans, various other papers on Corals, Sea Pens, and other animals of the same tribe, as well as on the Cochineal insect; on the Coluber cerastes, or horned viper of Egypt; on that singular animal, found by his friend Garden in Carolina, the Siren lacertina of Linnæus, now esteemed a Muracna; on the structure of the windpipes in several birds and in the land tortoise; and even on the method of making sal ammoniac in Egypt. It appears, moreover, | by many specimens of his collecting, that he was an assiduous observer of the internal structure or anatomy of vegetables. In Nov. 1768, sir Godfrey Copley’s medal was delivered to him by sir John Pringle, then president; and it being usual to single out some one or two papers in particular for such a compliment, one “on the animal nature of the genus of Zoophytes called Corallina,” in a letter to Linnæus, and another “on the Actinia Sociata,” in a letter to the earl of Hillsborough, both printed in the 57ih vol. of the Transactions, were selected for this purpose. 1 Reen‘i Cyclopwdia. Thomson’-. : Hist, of the Royal Society.